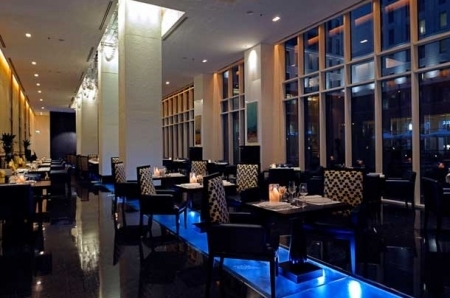 In the lovely surroundings of the popular Ritz Carlton Hotel DIFC, where 10 storey tall waterfall is cascading on one side and a room length long hand-blown bubble chandelier in the dining hall makes Blue Rain Restaurant a perfect venue to relish authentic Thai fare. Tucked on the fourth floor of The Ritz Carlton Hotel, this eatery’s delectable Thai food will make your every taste bud dancing with delight. These luscious dishes are prepared by the inhabitants of Thailand, who were specially brought to Dubai to impress people with their majestic cooking. In brief, dining at this wonderful restaurant means that its an amazing dining experience for every sense. Traditional Thai delicacies are the specialty of this restaurant where guests can also bask in these regional dishes in stylish hand shaped pottery. Visitors will find this eatery behind the 10 storey high waterfall of the The Ritz Carlton Hotel DIFC where they get to enjoy other amenities as well such as Wi-Fi, business lunch and wide range of beverages, including alcohol. Apart from this, pork lovers will also find it on the menu of Blue Rain. The menu of this eatery also comprises of vegetable and some delicious dishes along with desserts, chef’s specials, aside from appetizers and main course dishes. To view the entire menu of Blue Rain Restaurant, click here! The daily operational hours of this restaurant are from 6:30 pm to 11:30 pm, and these opening hours stay this way all seven days of the week. Plot B-95 Jebel Ali - Dubai - United Arab Emirates. 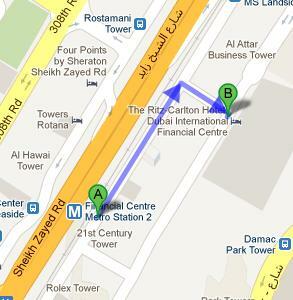 Financial Centre Metro Station 1 is 6 minutes walk from the Blue Rain Restaurant in the Ritz Carlton Hotel of Dubai, because the gap between these two sites is close to 450 meters. All patrons of this metro station need to do is to head in the northeast course and then make a right turn. After which they have to turn right once again in order to locate the destination few meters away on the left side. Head in the southwest direction from this bus stop, then turn left and afterwards make a right turn, to find the destination on the left side. Check out map for directions.